How do I book my Santa on the Beach photo?? All Santa on the Beach photo session must be booked via our website. Unfortunately due to the large number of families wanting to book I am unable to do this for you. Your session fee will allow up to 5 children and also allow up to 3 x different sittings. This means, that if you would like your children to have photos by themselves, though also with their cousins, then you can do this without having to book a second session. However, if there are more then 5 children visiting Santa, then you will need to book a second session. Please advise Jade via e-mail if you are unable to book consecutive times for your session and we will arrange for all your children to be photographed together. I can't seem to book a session on the website....Why?? When we are nearing the end of Santa photos things can be a little confusing on the website. We have 3 x colours on our calendar that indicated if you are able to book. All the Grey dates indicate that we are not working on these days. Green shows that we have availability and Red is booked out. Due to the number of families that would love a photo with Santa on the Beach, we unfortunately do not have a cancellation list. If there are a large number of cancellations I will post on Facebook letting everyone know and it will be first in first served. How will I know that my session is booked? Once you have paid via PayPal you will receive an automated e-mail advising that payment has been made. This is your confirmation e-mail!! Unfortunately we are unable to control technology and understand that e-mails can get lost in space. If you haven't received your confirmation e-mail (please check your junk mail first), please feel free to contact Jade who will be able to confirm your booing. Why are there more people booked into the same time as me? Booking times are in 15 minute time slots and are reserved for more than one family. The first family to arrive for each time slot will be the first to see Santa. Please note, that if you arrive early for your session you will not be guaranteed to see Santa at an earlier time. As we need to cancel sessions from time to time due to bad weather we may need to start earlier on some days to squeeze in those families who were rained out. Why do photos from the same session as mine look so much different? Because we are out in the elements of mother nature we just can't predict what the weather is going to be like. As the clouds, sun and wind are out of our control there can sometimes be photos only seconds apart that look completely different to each other as the sun has ducked behind the clouds for a brief moment and returned. If we have a cloudy day we are able to set up our sessions in any direction we choose, however if the sun is out we will need to work with the sun and turn our surfboard slightly to try and avoid those squinty eyes. My children are squinting and there is shadow on their faces....can anything be done about this? Once again, because of mother nature we can not control these type of things. We do our best to set up our sessions around the current weather situation, though some children (and adults) deal with the glare a little better then others. We try our hardest to avoid as much shadow as possible, though because we are on the East coast the only way to avoid this (and still have the water as our backdrop) is to face the sun directly. As you can imagine this is not really a good option as we would have lots of closed eyes. How many children can be booked in for a session? Family pets are welcome to attend their family photos, however they are not permitted on their own. The area of the beach that our photos are taken on is not an 'off leash' area, therefore all pets must be on a leash at all times. JadyBug Photography takes no responsibility for any animal not complying with Council regulations and/or any fines issued for infringement of these regulations. What happens if I have to cancel my session completely? Any cancellation made by you will have a $27 non refundable fee. All monies paid for products will be refunded to you, however, due to our busy schedule this may take 1-2 weeks to process. What will happen if it is raining on the day of our Santa photos? If by chance we have a rainy day for any of our sessions, we will endeavour to postpone the shoot or squeeze you into another day. If it is cold and cloudy, photos will go ahead, though windy weather will need to be decided upon on the day. In the event of rain I will not make a decision on cancellation until 4pm on the day. I will post a notice on the JadyBug Facebook page and also send out an sms message to advise. If you don’t see a Facebook message or receive an sms then please assume that your photo session is still going ahead. Do I get to choose the photo for my package? JadyBug will choose the best photo to print/e-mail. From experience, the photo that I believe to be the best is also the photo that my clients choose, so please have confidence that I will choose the photo with the best smiles, with everyone looking (well most looking) and the one that you will be happy to share with your family and friends. All prints and/or digital images will be ready 1-2 weeks after your session. Digital images will be sent via Dropbox. All prints and packages are to be collected from Belmont North. Exact location for pick up will be advised via e-mail once your order is ready. Can I have my photo edited personally to suit my style? Unfortunately due to the high volume of photos that we edit for the Christmas period, we are unable to edit your photo to your personal requirements. The edited photos you see on our website and Facebook will be the style that you receive. Your prints and/or digital images will be ready 1-2 weeks after your session. Please be aware that during busy periods the wait time to receive your prints/images will vary from each session. All prints are to be collected from my place at Belmont North and a order completion will be sent once your e tire order is finalised. I have purchased a Santa Letter, when will this arrive? Your personalised letter from Santa will be delivered by Moore Creative during the month of December. JadyBug will announce on her Facebook page when these have been posted. Please note that delivery can take up to one week, though please advise Jade if you have not received your letter one week after notification. Where do we meet on the day?? We will be setting up for photos at a location that is commonly known as ‘1st Creek’. 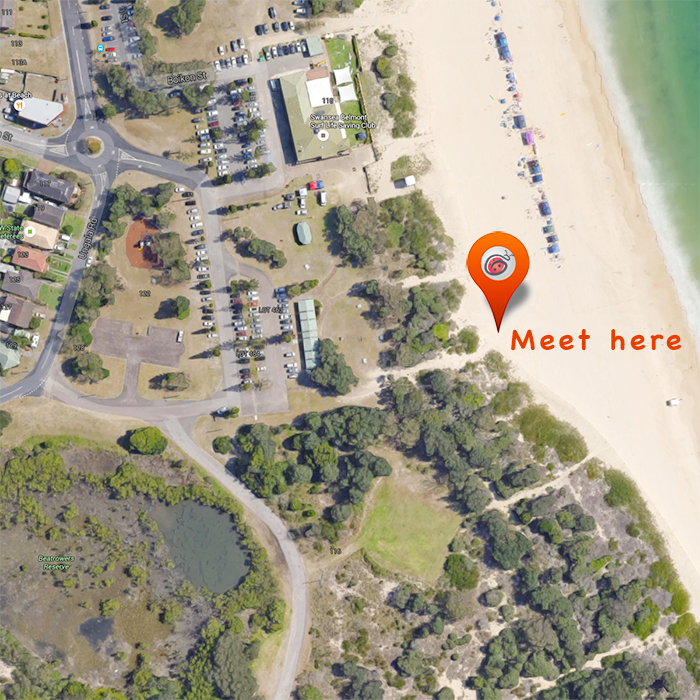 To get to 1st Creek you will just need to enter the Redhead Beach carpark as normal, though instead of heading down towards the surfclub, turn towards your right (south) and park at the furthest point of the carpark. There is an entrance to the beach at this end of the carpark and we will be set up down there. We have a new flag this year that should be easily visible when you drive into the carpark. Our Blacksmiths Santa photos will be half way between the Surf Club and the Break Wall. If you park near the public toilets and use the beach entrance that is to the right hand side of the toilets you will find us. Once again, don't forget to keep an eye out for our flag. 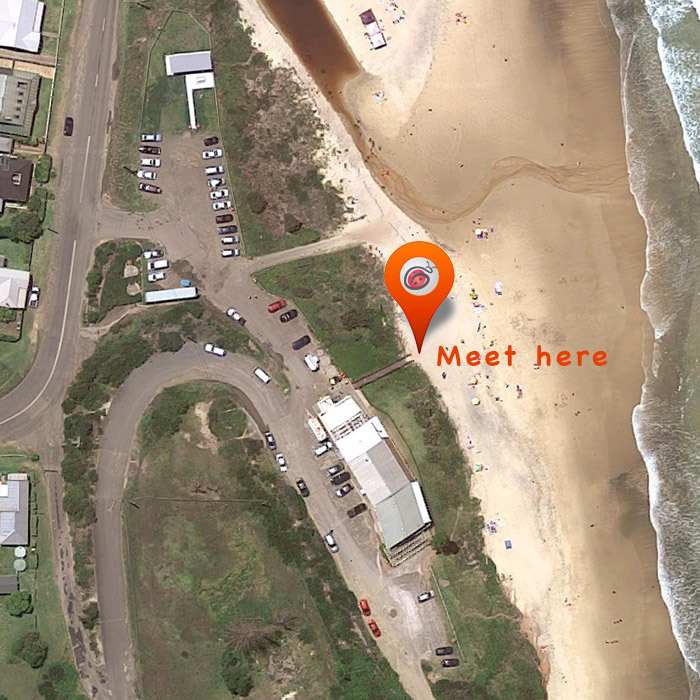 At Catho we will be setting up just slightly south of the Surf Club, towards the old coal loader (jetty). 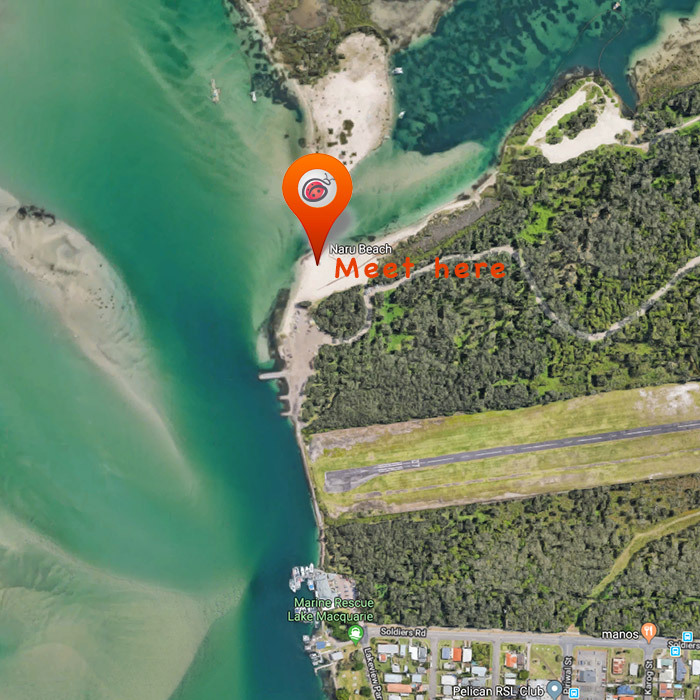 Parking in the Surf Club carpark is the best option, however being that this carpark is small, you will still able to find us easily if you park in the secondary carpark. 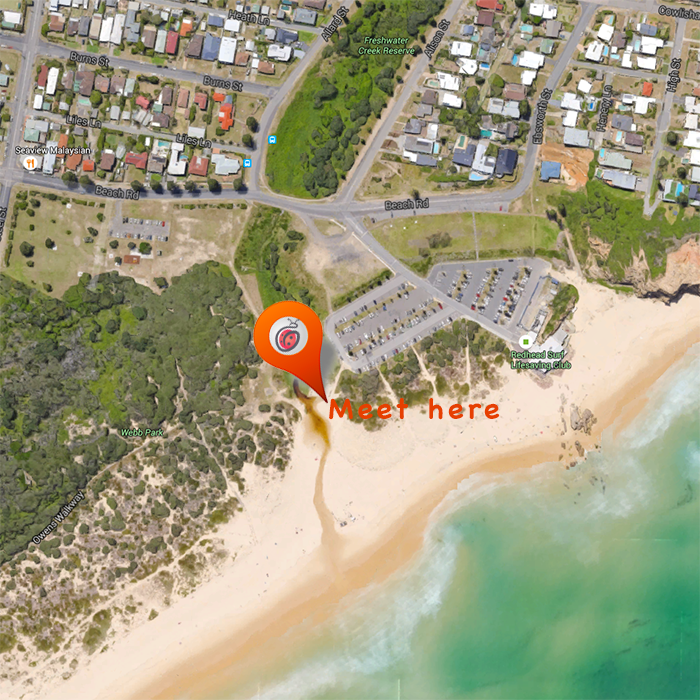 You will find our Naru location at the end of Naru St at Marks Point. If you keep driving to the end of Naru St you will notice it turns into a dirt road. Follow this dirt road down until you see our flag. If you are unable to find a park immediately near the flag, please drive around a little further where there is a large carpark that has a lot more space. Being Christmas we all want to dress our children in the festive colour of red. However, as Santa is also wearing red the children can get a little lost amongst the sea of red. If I can recommend that you try not to dress your children in an outfit of entirely red, so that they don’t blend in with Santa. At the end of the day, the choice is entirely yours, though we do want to be able to see your gorgeous children standing out as the star of the photo. Please also feel free to bring your children’s sunglasses and/or hat along for an authentic summer photo.